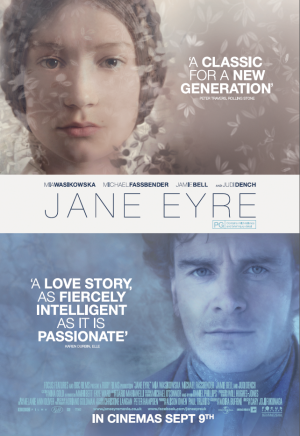 ‘Jane Eyre’ is a recent adaptation of Charlotte Brontë’s classic novel of the same name, starring Mia Wasikowska (‘Alice in Wonderland’ (2010)) as Jane Eyre, Michael Fassbender (‘Hunger’ (2008)) as Mr. Rochester and Judi Dench as Mrs. Fairfax. This film adaptation, although not as good as Aldous Huxley and Robert Stevenson’s 1944 version, is still better than the 1996 version starring William Hurt and Charlotte Gainsbourg. The plot is familiar to all. Jane Eyre, after a rather traumatic Dickensian childhood, becomes a governess at Thornfield Hall, a place of mysterious happenings, whose cold and brooding master, Mr. Rochester, perhaps presents the greatest puzzle for the heroine. First of all, the film makes every effort to stay true to the novel, covering all the major events. The film demonstrates Jane Eyre’s intellectual rigour and will to match Mr. Rochester’s intelligence and wit. The fact that Fassbender, playing Mr. Rochester, has so little screen time only contributes to his personality remaining so enigmatic throughout the film. While some interesting passages in the novel were omitted from the film, for example, Mr. John Rivers’ infatuation with Rosamond Oliver, this move is understandable given the film’s length. ‘Jane Eyre’ has a very clever pace, cutting back and forth in time in a flashback manner as the story unfolds: we first see older Jane fleeing Thornfield Hall, and then we are introduced to her childhood. This provides a fresh spin on a familiar story and gives some realism to the picture. The setting of ‘Jane Eyre’ is the magnificent medieval Haddon Hall in Derbyshire, which had cameo roles in both ‘Pride & Prejudice’ (2005) and ‘The Other Boleyn Girl’ (2008). Haddon Hall in ‘Jane Eyre’ provides just the right eerie, darkly gothic atmosphere, which the film of this calibre so desperately requires. Wasikowska and Fassbender’s screen chemistry may not be the greatest in film history, but, given the story at hand, this may have its advantages. The appearance of aloofness of the main characters, and the seeming incompatibility of their personalities is the exact point of the story. The real Jane Eyre should be the near-exact opposite of Mr. Rochester in both spirit and will power, and what better way to convey this, and boost the mysterious attraction between the two, than to cast so contrasting the actors to make the audience subconsciously question the characters’ compatibility? What is certain, however, is that the director, Cary Fukunaga (‘Sin Nombre’ (2009)), has succeeded to convey the emotional intensity between Jane Eyre and Mr. Rochester. The almost-sexual inner tension between them is felt from the very beginning, and their rapidly growing silent fascination with each other and later attachment are conveyed masterfully (even though Mr. Rochester’s “transformation” from a brooding and cold master to a helpless “Romeo” is perhaps made too soon in the film). However, while the main cast seems nearly perfect, Amelia Clarkson, who plays young Jane Eyre, is completely miscast. Nice review. I also really enjoyed the film – much more than I thought I would. Thanks, and I am very glad to hear that.